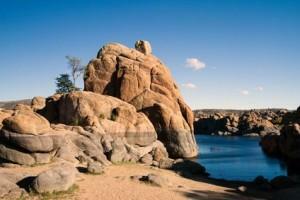 Only two hours north of the state capital, Prescott is one of the places that makes living in Arizona worthwhile. Filled with a rich history and culture-driven community, Prescott has been one my favorite places to visit in the United States. Once you enter the heart of the town, you completely forget you’re actually in the desert state of Arizona. The town square is reminiscent of the one in Back to the Future, complete with a clock-mounted court house building. Heading out past the town square on Montezuma Street and making a right on Copper Basin Road, I drove about 5 miles until I came across a dirt road which was no threat to my my Jeep. Climbing the hills and winding road, I passed a few summer camps until I found myself in some real rocky territory. Again, not too much of a problem with my Jeep. Once I was back on the trail, I found a campsite that was far enough from the road that I wouldn’t have to worry about dust blowing through my camp. Once I was set up, I decided to hike a bit more up the road to see what I could find. It was perfect timing to take a hike. The sun was going down and the air was starting to get colder. I walked about a mile until I found an incredible clearing that looked out to a wide area of trees and mountains off in the distance. I sat there for a while watching the sun go down and kicking myself for not bringing my camera! One of my favorite things to do when traveling alone is watching the sunset. For some reason or another it always gives me a sense of wholeness. The earth moving around the sun, the day coming to a close, the stars beginning to shine; as one cycle ends another begins. Before it was too dark I headed back to camp to find none other but a skunk going through my bag. If there’s anything I can’t stand when camping, it’s skunks. Luckily, however, I was able to scare it off with some rocks and didn’t have to suffer any stink spray. I didn’t waste any time getting my fire started and preparing my meal for the evening: pasta! When camping, especially solo camping, I find that pasta is one of the best foods to make. It fits easily in your bag, it doesn’t consist of too many ingredients, and the clean up is easy. If you ever find yourself in the Valley of the Sun and choose to head North, I recommend visiting Prescott during the months of May through September. It can get pretty cold during the winter, but the summer months are full of incredible weather and sunshine. Try to avoid the end of July, as that is typically the monsoon season.